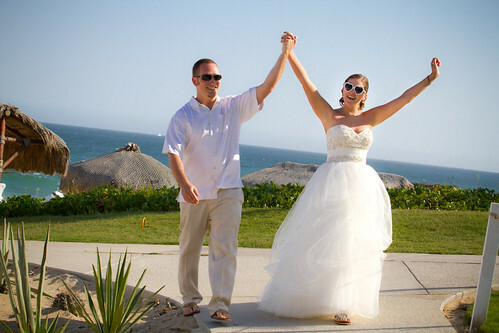 After officially getting married at San Francisco City Hall with our small crew of two, we went all out and had the dream wedding we never hoped for in Los Cabos, Mexico. 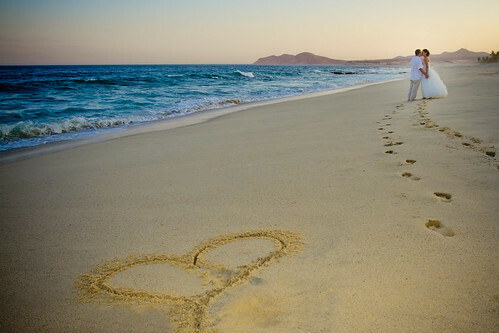 I say never hoped for, because I never thought of a destination wedding when I was playing with my barbies as a 7 year old. Even when my Mom brought it up to me as a joke (probably more of a hint than a joke actually) I laughed it off and thought “no thanks!” But after “real” wedding planning started and we did a million hours of research and even went and viewed a location, I started to feel extremely anxious and all I wanted to do was run far far away from all the planning. Barbie’s wedding was so much easier. 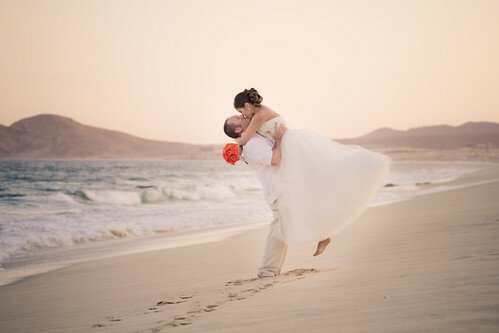 Mom’s destination wedding idea wasn’t looking so bad after all. We looked into it a bit more and became instantly excited. Not only did we find a beautiful spot, but the resort did most of the work for us. WIN! 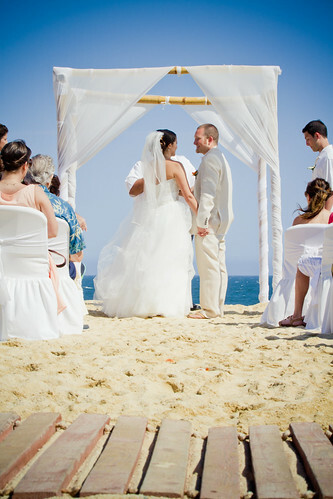 So, we gathered 30 of our closest friends and family, headed to Mexico, and got married on the beach at the amazing Dreams Los Cabos. 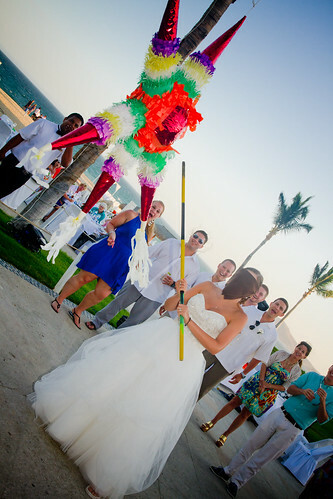 It was better than we could have ever dreamed (minus the whole bride and groom being the only ones who got sick….like, Mexico sick….not pretty…but TOTALLY worth it). Greg and I decided to do a first look before the wedding, and I’m so glad we did. It was such a special moment just for us. He looked so handsome and the smile he made when he first saw me was something I will never forget. Finally, we got to the I Do’s and the big kiss! It was fun hearing Rev. Arechiga say repeat after me “With This Ring, I Pledge to You My Unconditional Love, To Infinity And Beyond.” We got a nice little laugh out of that one. 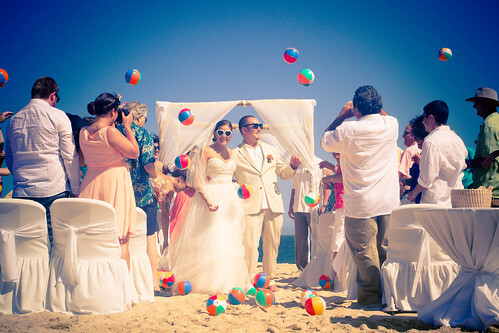 Instead of rice, we kept with the beach them and had our guests throw mini-beach balls. Which we used again for this awesome picture (my favorite pic which is now the background on my computer). We took a bunch of family pictures, but nothing compares to this awesome picture with my new brothers. And Greg has a new sister too! 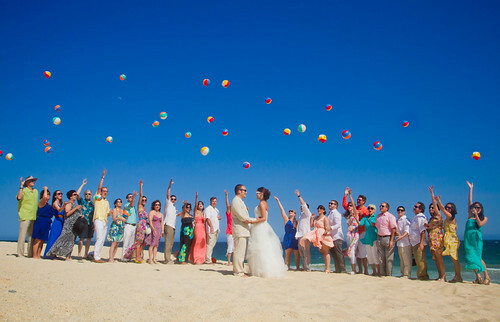 Seriously, we were having WAY too much fun with the beach balls! We hadn’t seen the reception area all decked out, so walking in to the party was awesome. Especially because not only were our guests cheering for us, but a bunch of hotel guests were too! We were rock stars! 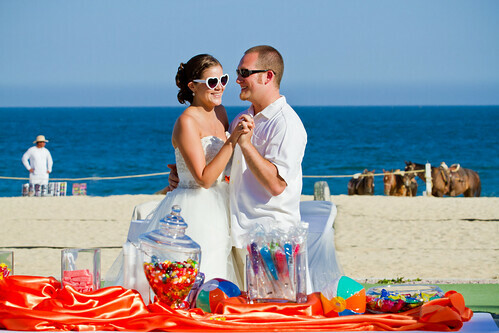 We did our first dance in front of the candy bar (yes, a candy bar! The hit of the whole party) to Adam Sandler’s, Grow Old With You. 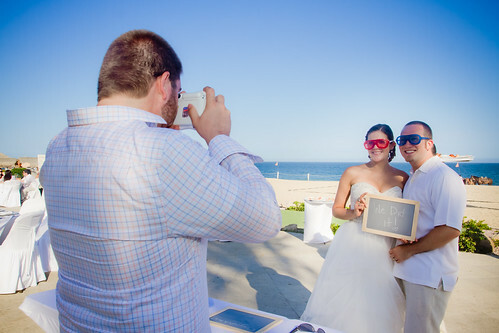 For the “gust book” we brought some chalkboards and a poloroid camera for everyone to send their well wishes. 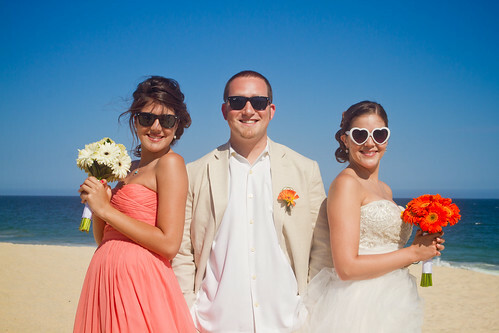 We got in on the action too, with our stunnas on of course! Greg was very adamant about making our cake topper. He made a fun 8-bit cutout of the two of us which turned out great! We went into town a few days before to get this bad boy. 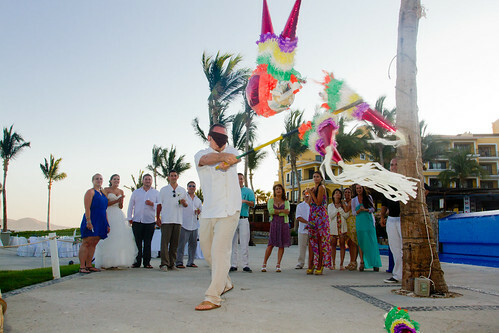 Although Greg almost killed his mother-in-law when he took his first swing, the piñata was a highlight of the reception! After the piñata we snuck away for a few sunset pictures. Greg’s serious dance face is the best! 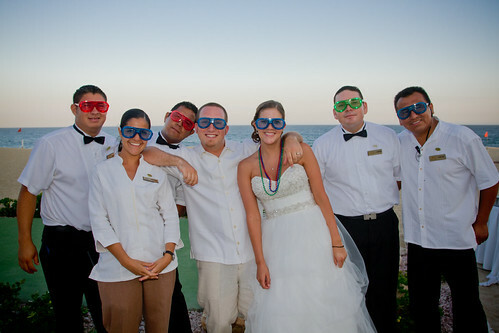 A special thank you to the staff at Dreams Los Cabos, especially Mariana (the wedding coordinator master! 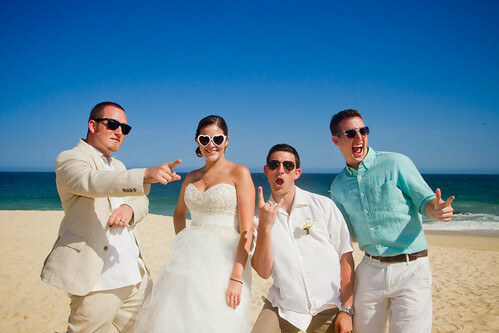 ), who made our wedding a night to remember! Also, thank you to Elizabeth from Adventure Photos for these amazing pictures that we will cherish forever. Some of these photos gave me chills! And I may or may not have teared up a bit. I’m so happy for you! Congratulations! 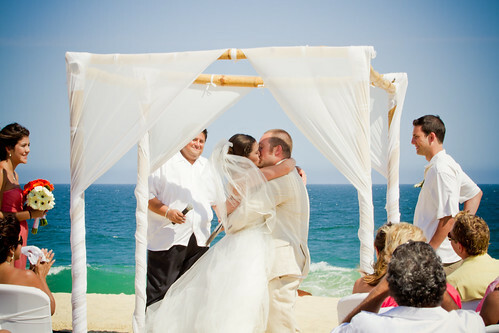 I totally tear up every time I look at the pictures! It was such a great day. I can’t get enough of these photos! Your dress…to die for. So gorge. Congrats again to the Gerbers!! We had the best time! I want to go back and do it all over again! Mostly so I can wear my dress again! ha! LOVE LOVE LOVE LOVE! I’m so honored to have been there. The pictures are fantastic and the story is even better. Love you guys!!! 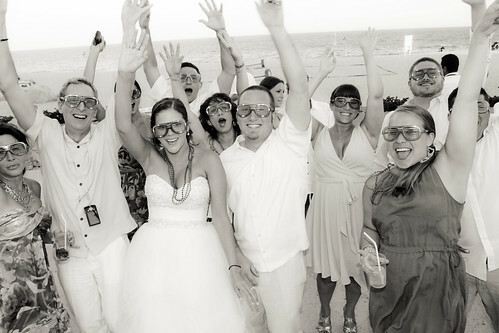 Can’t stop looking at the pictures, lets do it again! !A wonderful time was had by all!! 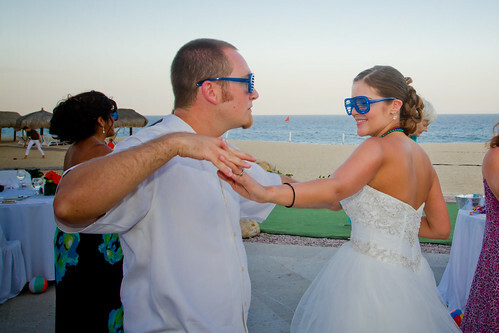 Almost a year since we’ve been to Cabo for your wedding. I love all these pics. It feels like yesterday. 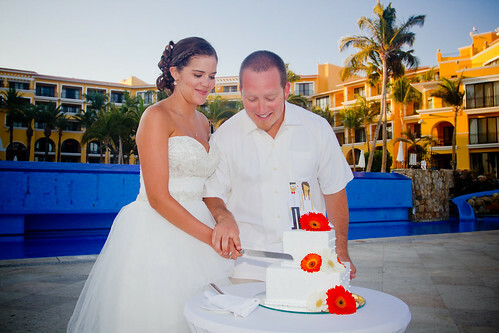 We’ll be there for your Mexican wedding Anniversary toasting u both. Olive juice!